The following is a partial list of the business opportunities that are currently available for sale through Business Intermediary Group LLC. All of the opportunities for sale may not always be posted on this page. There are additional offerings available that might be more suitable for a strategic buyer, as well as companies that are ready to sell but are waiting for the right buyer to connect with us. Serious buyers are encouraged to contact our offices directly to discuss all of the possibilities that are available and to become part of our active buyer database. A link to our Buyer Registration Form can be found below and elsewhere throughout the website. The availability of these offerings changes frequently, as new listings are added and businesses are sold. Please check back regularly for current opportunities. The owner's understandable concern for confidentiality precludes providing more specific information on this site. 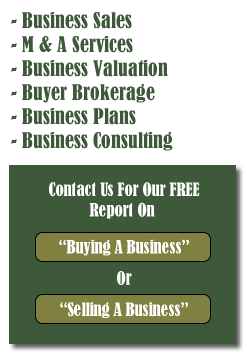 Please contact the Broker to request a more detailed Confidential Business Review (CBR).